Please remember your gift is tax-deductible and your support ensures that programs continue to grow to meet the needs of our talented students. Matching Gifts are often available from employers’ matching gift programs and can double or even triple your contribution. Please call the Advancement Office (203) 362-2569 or the Business Office (203) 362-2561 for assistance. Thank You! Along with tuition, careful fiscal oversight and occasional capital campaigns, a robust Annual Fund is a key component of every successful independent school. Each year Unquowa relies on its Annual Fund to provide vital support to the school’s operating budget. In recent years, the Unquowa Annual Fund has supported financial assistance, professional development and support for faculty and staff, innovations to programs and curriculum, field experiences, performing arts, athletics, technology purchases and more. No amount is too small and every gift is greatly appreciated. Thank you! In thinking about establishing our Legacy Giving Society, there were many decisions to make, but one thing was perfectly clear from the start. 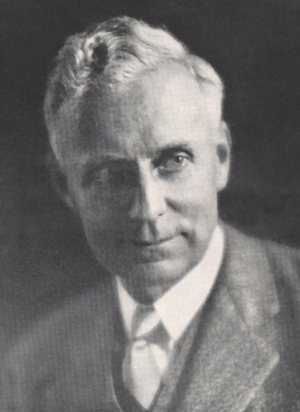 As a key component of securing the school’s future, it had to be named for the school’s longest sitting headmaster, Carl Churchill, whose twenty year tenure shaped the early years of the school’s history and laid the firm foundation for its progressive philosophy. Mr. Churchill understood and put in place at Unquowa the progressive education model of learning by doing, evidence of which we see in vintage photos that grace our halls today and the practice of which continues to grow each year at Unquowa. In the annual report of 1940, Mr. Churchill wisely emphasized the counterintuitive notion that parents should not save their money for boarding school and college but rather spend it on the early years of their child’s education “to induce the habit of mental exploration, discovery and achievement” that would serve them through life. We cannot thank Mr. Churchill enough for the clear, steady path he laid for his successors, a path which has allowed our school to near its 100th anniversary providing the robust, impactful educational experience for children that Mr. Churchill worked so long and so hard to establish. Legacy Giving is a way for you to support The Unquowa School through a long term strategy of directed giving that benefits both you and the school for years to come. While any gift to the school provides vital support, a planned legacy gift offers a unique level of long-term security that strengthens Unquowa’s financial foundation for the future. 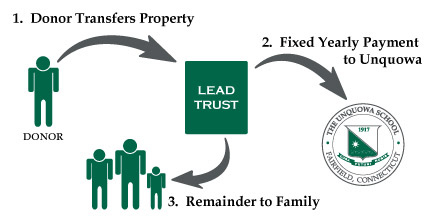 As with all giving to the school, you have the option of directing your legacy gift towards an area at the school that you are passionate about or leaving it unrestricted for the school’s leadership to determine where it is needed most. 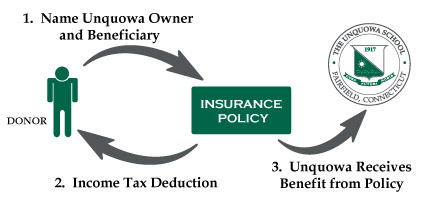 The legacy giving tools described below each offer a different path that you can take to support Unquowa while providing possible tax and inheritance benefits to you and your family. While Unquowa can accept and monitor the legacy giving strategies included here, the school is not in a position to provide financial advice. 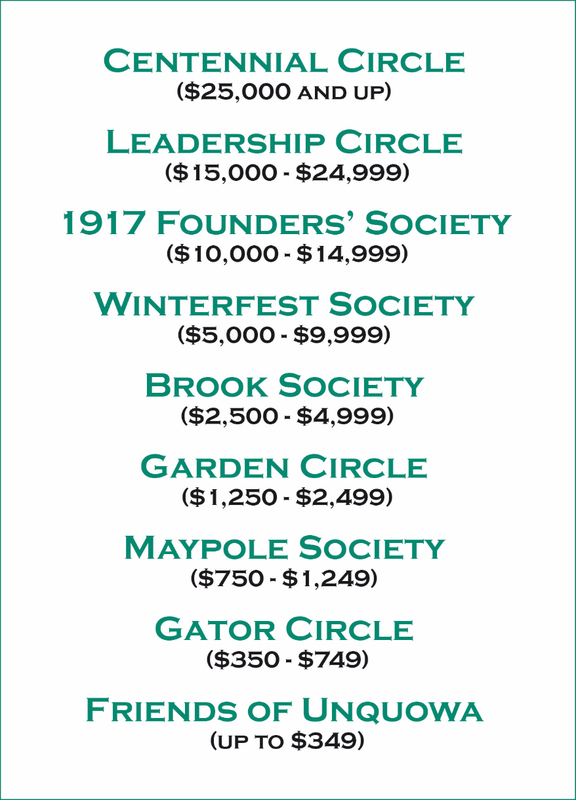 Therefore, if you are considering making a gift to the school through one of these strategies, we suggest you discuss these options with your financial advisor. Together we are making Unquowa stronger for the students who are here now and for those who will join the Unquowa family in the future. On behalf of all of them, thank you. 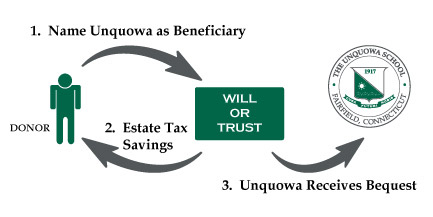 Gifts From Your Will or Trust : This gift does not affect your cash flow during your lifetime, and provides significant support to The Unquowa School. 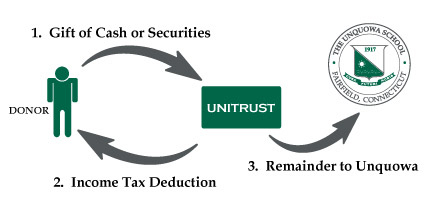 Charitable Lead Trusts : This gift allows you to provide significant annual support to The Unquowa School now, while reducing the taxes on assets passed to your heirs later. Charitable Remainder Unitrusts : This gift benefits you and your designated beneficiaries now and The Unquowa School later on and for years to come. Gifts from Retirement Plans at Death : This gift supports The Unquowa School and its students for years to come. 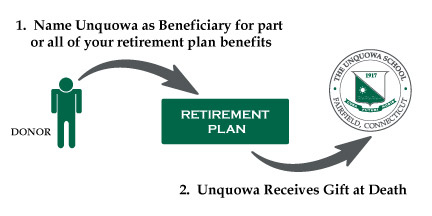 Gifts of Life Insurance : This gift allows you to provide significant support to The Unquowa School without adversely affecting your cash flow.